The Royal coat of arms of Scotland was the official coat of arms of the Kingdom of Scotland until the Acts of Union in 1707. The blazon of the arms began to undergo significant changes following the Union of the Crowns in 1603, and eventually became the Royal coat of arms of the United Kingdom used in Scotland. And bring my saulle to ane good end." 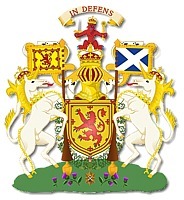 The supporters are two crowned and chained unicorns, the dexter (or right) supporting the banner of the arms and the sinister (or left) supporting the national flag of Scotland. The compartment features a number of the country's national flower, the thistle. A form of these arms was first used by King William I in the twelfth century. Throughout the ages, the arms passed from monarch to monarch with only the slightest variations in detail. The shield began to change dramatically in the sixteenth century, however, when Scottish monarchs began to intermarry with other royal families, and thus sometimes wore multiple crowns. Other elements, such as the banners of the supporters, also transformed with the political situation as Scotland and England merged. 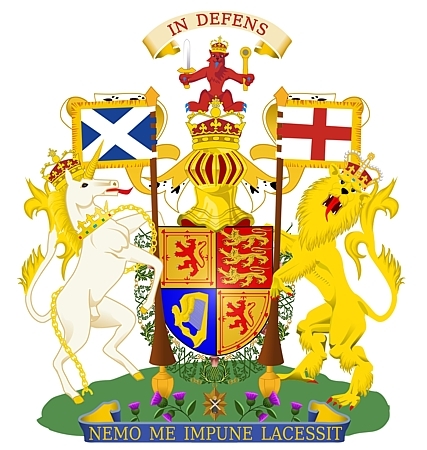 The modern Royal coat of arms of the United Kingdom used in Scotland show the red lion rampant in the first and fourth quadrant of the shield, with three striding lions with their heads turned forward (in heraldic language, passant guardant) in the second quadrant to represent England. The third quadrant features the harp of Ireland. The left (or sinister) unicorn is replaced by the Imperially-crowned golden lion of England, who supports a lance displaying the flag of England. The flag of Scotland replaces the banner of the arms supported by the right (or dexter) unicorn in the original version. The Scots motto In Defens appears as it does in the original arms, as does the motto of the Order of the Thistle. The Royal Standard of the United Kingdom is taken from the shield of the coat of arms, and is flown when the monarch is in residence at Balmoral Castle or Holyrood Palace, on the monarch's car on official travels, and on the royal aircraft when it is grounded. It may also be flown on any building, public or private, while the monarch is visiting it, if the owner or proprietor requests. This banner is also flown outside the Scottish Parliament Building in Edinburgh when the when the monarch is in attendance. The Royal coat of arms of Canada is closely modeled on those of the United Kingdom, with distinct Canadian imagery replacing British symbols. 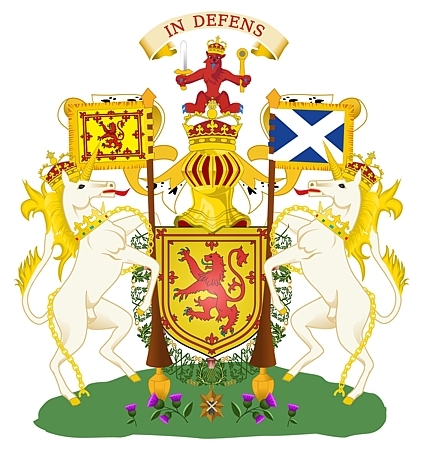 The Canadian arms feature the Scottish unicorn; the chain around its neck is broken, symbolizing his resistance to oppression. 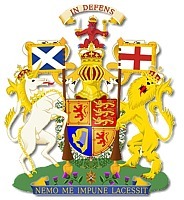 The Royal arms of Nova Scotia also feature the Scottish unicorn.